There's something admirable about a bear who isn't afraid of the sun. A Teddy who sits patiently on a windowsill for years, letting the rays of light work their magic on his coat, gently bleaching it for a very special effect. Richard Steiff realized this fact and made the amazing color of this 1925 replica as a "one-of", but it was never commercially produced. This beautiful shade has been brought back to life by the artisans at Steiff-Schulte, Steiff's mohair manufacturer. In preparing the fabric for this bear, they played the role of the sun - bleaching the mohair in a fraction of the time. The sun-kissed look is most appealing and really makes this bear wonderful. 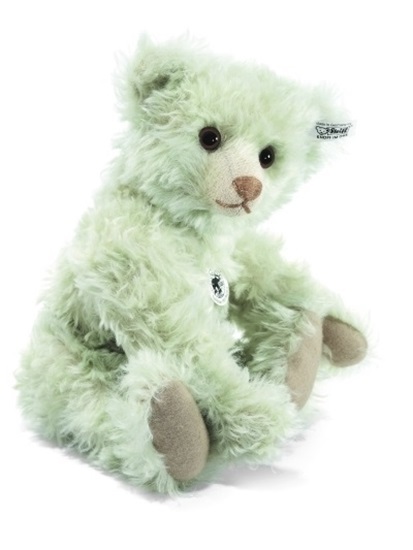 Unusually colored bears are rare for Steiff. To make him even more -- UNIQUE, he is kapok stuffed and has glass eyes. These are just some of the features that make this bear so desirable. He is 14 inches tall and a limited edition of 1925.